One's a near-final prototype. The other's a near-utopian concept. Both show a company with at least some of its attention focused on the future. Volkswagen isn’t leaving diesel behind, but it’s charging ahead with cars that plug into the wall—and plug into your life. At CES in Las Vegas, the company unveiled two EVs: a near-final prototype called the e-Golf Touch, and a concept car called the BUDD-e. Both show innovative tricks that were clearly years in the making rather than convenient distractions from scandal. 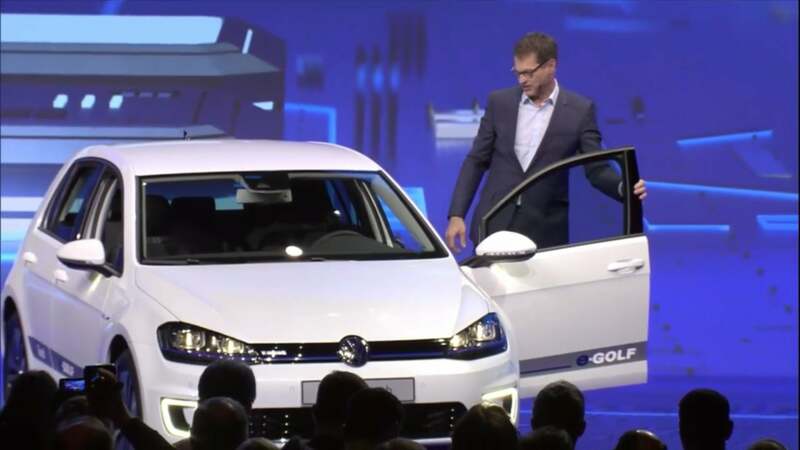 The e-Golf is already on sale, but the Touch version Volkswagen showed could come to market fairly soon, the company said. As you might guess from the name, it includes a 9.2-inch touchscreen infotainment system. The system can also take input via natural-feeling voice interactions as well as gestures. It sports a fully digital instrument cluster just like the one debuted by the company’s Audi subsidiary in the TT roadster, in mid-2015. The e-Golf Touch could show up on car lots relatively soon. 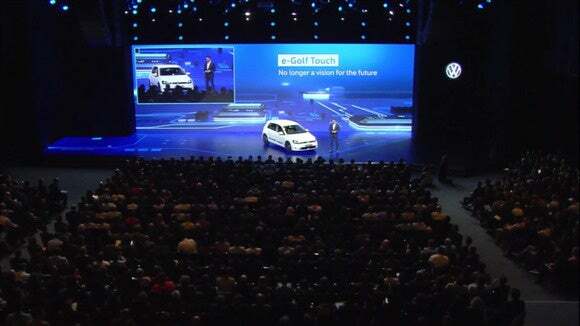 Smartphones will be pampered by the e-Golf Touch. The car will include an inductive charging pad in a little bay in the center dashboard area; USB-C charging; and an app that you can use to control the car. The e-Golf Touch sports a huge infotainment system and inductive charging for your phone. An Apple Watch app includes preconditioning controls that can be timed for when the car is charging, so the car won’t have to spend as much battery power on heating and cooling. It also offers speed- and location-monitoring to keep teen drivers in line. The Volkwagen BUDD-e concept bus. Then Volkswagen took the original Bus, its classic hippie car and family camper of the 60’s and 70’s, and evolved it into the BUDD-e concept. 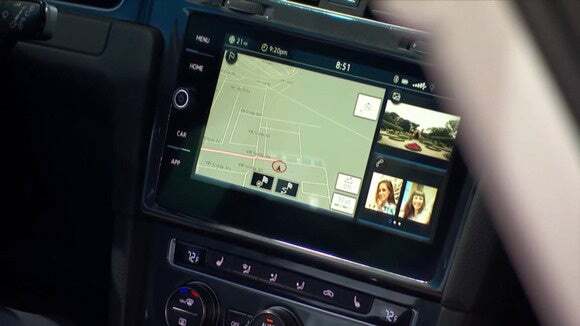 A Millennial party car of sorts, BUDD-e lets friends share an Internet connection as they ride, and contribute content to a large, shared screen in the passenger area. If you thought the e-Golf Touch’s digital displays were advanced, BUDD-e goes for three screens total, surrounding the driver, where features float on and off the screen as you need them. The BUDD-e’s likely EV specs were these: A range of 233 miles according to the EPA standard. A charge time of 30 minutes to reach 80-percent capacity. A battery built into the floor to open up space and reduce the center of gravity (Tesla did this first, but it’s a good idea worth appropriating). Whoa, three screens in the BUDD-e? Far out, man. True to its name, BUDD-e will use its connectivity to be a helpful companion in your everyday life. 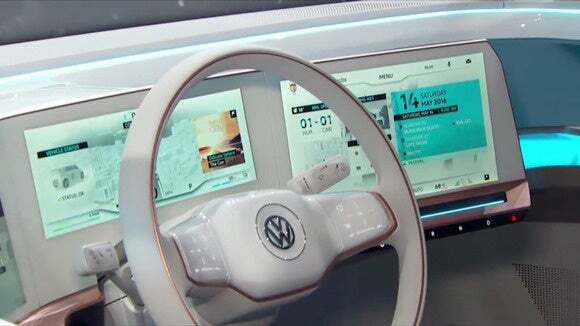 Volkswagen demonstrated early-stage apps where BUDD-e could hook into your smart-home systems to coordinate when things go on or off depending upon your location and context (will you be at work for 8 hours or at the grocery store for one hour, for example). Speaking of groceries, it could hook into your smart refrigerator and remind you to pick up more beer while you’re out. Volkswagen has a long haul out of its diesel mess, and these car innovations don’t change that. 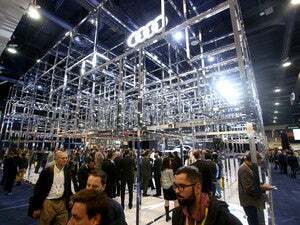 What they do show is that Volkswagen has some ways forward, and that’s a much-needed positive for the bruised company.